The Vietnam War was unusual for many reasons, one of which was the detail of the reporting and journalism. Telecommunications and jet travel made reporting on the war easier than other conflicts like the Korean War. The Vietnam War was not the most vicious war of the era, but it was the most visible to Americans. That visibility was one of the causes behind the protests that are now historically associated with the war. This is a Pulitzer winning photograph taken on June 8, 1972. It is informally known as “the napalm photo” or “napalm girl” and is one of the most haunting and iconic images of the Vietnam War. At the instant of capture, a South Vietnamese army has instigated a napalm attack on the village of Trang Bang. A nine year old girl named Phan Thị Kim Phúc has been burned by the attack and flees the scene alongside her neighbors and a handful of American soldiers. The evocative moment was captured by a photographer who took the children to safety in Saigon. Kim Phúc survived and today is a recognized philanthropist and writer. Undoubtedly one of the most memorable photographs of the twentieth century, it goes beyond the capture of that horrible moment to highlight the disparity between the image of the war established by the government and the reality. Moments like this have been occurring for thousands of years, but to have such personal coverage of a current event was new for Americans. Even President Nixon doubted the authenticity of the image. This photograph is known as the “Saigon Execution” or sometimes by the name of the man being shot, Nguyễn Văn Lém. It was also a Pulitzer Prize winner, in 1968. Linked below the photograph is a brief video of the same event. A journalist named Eddie Adams captured it on February 1, 1968, more than four years before the photo of Kim Phúc. 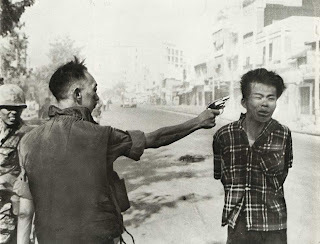 The shooter is the Chief of the Republic of Vietnam National Police and the victim, Lém, is a member of the Viet Cong. Lém was shot because of “suspected guerilla activity and war crimes,” but it would be reasonable to consider his death the result of a wartime mentality and a braggart general. Like the first photograph this image had a galvanizing effect on the anti-war movement in America. The major war before the Vietnam War, the Korean War, received less public attention because of its associations with World War II and its relative inaccessibility due to relatively undeveloped reporting technology. The adult Americans at the time were a decade too early for the social changes and youth empowerment of the 1960s. The wars after the Vietnam War, especially the war in Afghanistan have enjoyed the next generation of photojournalism and reporting in wartime. We do not have the sweeping social changes that made the Vietnam War protests so iconic, but we do have access to images and footage that history will remember as vividly as the two photographs presented here, like Abu Ghraib prison and the rending of Kabul. For excellent images of the wars abroad and other current events, follow the blog on Boston.com called The Big Picture. Below is a link to a post of photographs in Afghanistan from January 2011. The Vietnam War certainly was as controversial as it was due to media coverage. The fact that millions of Americans could see these pictures while their sons and brothers were stationed in Vietnam was a major reason for the mass protests here in America. This is just another example of how the media can stir up controversy, and sometimes massive riots, a la the Kent State massacre. These images, specifically the one with the little girl, truly are disturbing. After the Vietnam War, media coverage during wars became so much more prominent. Think of the coverage CNN had during the beginning of the "War on Terror." Simply put, popular media helps spread the violence of war into our homes through television, radio, and now the internet. I also find the power of media and violent images to effect us and public opinion fascinating. No doubt that these iconic photographs and the accompanying negative press on the Vietnam War galvanized much of the public to be against the war at the time. I think the nail in the coffin may have been the media coverage on the Tet Offensive, with Walter Cronkite stating on television that the war was all but lost. Though some historians looking back now think that the war was still very winnable even after the Tet Offensive, the media coverage of it at the time played an important role in us giving up and withdrawing from Vietnam. While images of war are certainly disturbing and depict things that most people do not want to see, they are scenes that are important to be seen. The declaration of war is an act with profound consequences. As members of a nation with one of the largest and most powerful military forces on Earth, we need to use our power to create war responsibly. Especially in cases of wars fought on foreign soil, as a civilian, it is easy to become distanced from the true nature of the violence being committed in the name of your nation. One can easily become caught up in political or religious rhetoric justifying a war, and forget that the lives of real human beings are being taken in the name of ideological premises. With the recent development of wartime reporting, the public can no longer remain dissociated from the nature of war. While viewing these images may be disturbing, I feel that it is a necessary evil that by making the reality of combat visible to all, will ultimately serve to temper future ambitions of war. I think these are very important photos that, although they are disturbing, showcased the severity and weight that is carried with war. I do not think the American public really knew what was going on when a war was going on in some far away country. We have never been occupied by enemy forces and therefore have no idea what it is like. These photos give us some insight into how it is to live in fear and worry about surviving each day. It might seem cruel to display these peoples pain for the world to see, but in the end, the purpose of these photos is to bring to light the results of war, which will hopefully dissuade future generations from jumping so quickly into combat. The media love to hand out Pulitzer Prizes for shocking images of death and shooting yet refuse to publish pictures of aborted fetuses because they are obviously babies.